There is a nice article about how to enhance your Pinterest feed beyond the basic Pinterest functionality over on sociable.co. 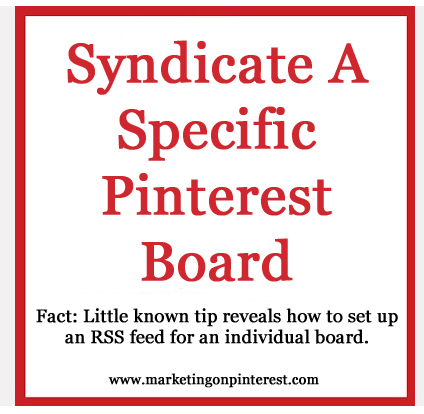 The article, “How To Generate RSS Feeds for a Pinterest User & Pinterest Boards” is a good one. Following a specific board created by a user via RSS is less obvious. If you visit a user’s Pinterest Board you’ll see that there are no links to subscribe to that board’s RSS feed. But you can still generate a feed for it. The RSS feed will show you the last 20 or so pins created in that board rather than the full contents. You won’t be able to see the comments for pin but your feed will be updated when new items are added. The site does provide an RSS option for user profiles; this feed combines all the latest pins a user has created regardless of which board they are in. To generate this RSS simply click on the user’s profile and select the RSS icon on the left of the page. Another way to do this is to add feed.rss to the end of the user’s profile; for example, if you want to see the latest pins by Felicia Day your RSS URL would look like this http://pinterest.com/feliciaday/feed.rss.